Every now and again, I tie on my Hello Kitty apron and try my hand at a "healthy" recipe for mac and cheese (an oxymoron, I know). I love comfort food but, at the same time, I'm not really in the market for a quadruple bypass. This is the dichotomy that plagues my being like the timeless rivalry between the Crips and the Bloods. Unfortunately, most of my attempts to recreate the flavor and consistency of traditional mac and cheese with less artery clogging ingredients border on disaster. And what is the one lesson I fail to learn, time after time? Never experiment with a new recipe when cooking for a group of people. My most recent brush with calamity came to pass on the heels of potluck baby shower. Perusing the list of items already spoken for, I noted a huge hole in the menu: no mac and cheese! 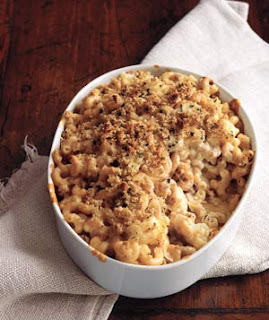 I had been meaning to try a recipe for Macaroni and Cheese with Cauliflower clipped from Real Simple magazine. This recipe boasted, "Using extra-sharp Cheddar lets you use less cheese without giving up flavor. Tender cauliflower adds fiber and vitamin C." I was skeptical about the cauliflower, as I can't say I'm a big fan, but I've made several recipes from the magazine and have always been pleased with the results. Throwing caution and time management to the wind, I decided to give it a whirl. In the midst of chopping breadcrumbs and cauliflower, grating cheese, dicing parsley, and measuring all the extraneous ingredients, I remembered, once again, why I need a prep cook or, at the very least, an intern. This recipe is a serious time commitment. The prep work alone took almost an hour. "Real Simple?" I think not. The recipe called for an entire head of chopped cauliflower, a bit overconfident considering five out of ten people hate cauliflower (a totally made up fact but seems accurate). I chopped up half a head just to be on the safe side. A mere 1-1/2 cups of extra sharp Cheddar cheese seemed stingy, so I grated closer to 2 cups. I splurged and bought Black Creek Wisconsin Classic, Extra Sharp Cheddar Cheese (Bold & Creamy), aged 3 years. I found this is in the fancy cheese section at Vons. I've included the original recipe below for your reference. Once all the ingredients were in the pot on the stove, I tasted it and wondered WWHKD (what would Hubert Keller do?). It was fatally bland and watery. The consistency completely lacked creaminess, an imperative for good mac and cheese. I suppose the sour cream and milk were meant to replicate a Bechamel sauce but it didn’t work. It was a runny mess. The only way I could think to salvage it was to dump in more cheese. I grated both blocks of extra sharp, high quality Cheddar and shoveled it into the pot in desperation. The good news is, you can dump two blocks of extra-sharp Cheddar on a dish sponge and it'll taste decent. That said, I was still very disappointed with the end product. The crumb topping, made from multigrain bread, parsley, olive oil and S&P was crispy and had a nice flavor but it would have been ten times better with some Parmesan mixed in. The Cheddar did give the dish tanginess but the cauliflower transformed it into a casserole-like consistency rather than traditional mac and cheese. The use of multigrain macaroni may have been the final nail in the coffin, though I have used it before and nobody knew. At the baby shower, the mother-to-be asked if I put potatoes in the mix. Can you imagine? Another guest thought maybe the cauliflower pieces were leeks. So if nothing else, it turned out to be a fun party game: "Guess the weird mystery ingredient in this Mac and Cheese." Several people said they liked it and one guy even took some home but I think they were all just being polite. 1. Heat oven to 400° F. Cook the pasta according to the package directions, adding the cauliflower during the last 3 minutes of cooking time; drain. 2. Meanwhile, pulse the bread in a food processor until coarse crumbs form. Add the parsley, 2 tablespoons of the oil, and 1/4 teaspoon each salt and pepper and pulse to combine; set aside. 3. Return the pasta pot to medium heat and add the remaining tablespoon of oil. Add the onion, 3/4 teaspoon salt, and 1/2 teaspoon pepper and cook, stirring occasionally, just until soft, 5 to 7 minutes. Mix in the pasta, cauliflower, cheese, sour cream, milk, and mustard. 4. Transfer to a shallow 3-quart baking dish, sprinkle with the bread crumbs, and bake until golden brown, 12 to 15 minutes.